One of the challenges is that their existence and adequacy is not always clear. Established building lines and fence lines are probably where the road reserve boundaries lie, but the pattern is haphazard, and as congestion grows their adequacy should be questioned. As building construction reaches close to the roads everywhere, one wonders how well these valuable green lungs of transport are going to be protected. Obviously so because who could long ago have planned road reserves to be adequate forever into the future, and what commitments to their reverence exists among those empowered to violate or enhance their purpose. In some cases road reserves have already been violated, as demonstrated by the cases of Moffat Park and Fig Tree below, and construction without consideration of impact on road space, as in the case of Wonderwonings, also below, is a further violation. Construction of cycle paths and the planting of trees close to the road locks existing boundaries, even if space for future widening had been available. Continued construction close to the road along major routes will make any future widening impossible. Everywhere the questions hang, what can be done to reduce the congestion, and is there enough space to build the roads of the future. We will look at the pattern of the past and try to project it into the future, but what ever views are taken, the question of future road space needs to be addressed urgently while there is still time, before the last remaining open spaces are also built up, without a broad bold plan for the future. When we talk Road Reserves, we need a very long telescope. We are talking about space that was left for us 50 or a hundred years ago by persons long gone who had no means of seeing the requirements of us, their descendants, 50 or a hundred years into the future. Anyone who did have the vision would have been seen as a Jules Verne kind of dreamer and not taken seriously. Yet their decisions of how and where they built impact on us, severely, only today, now that we need to be looking critically at what they left us and what our road space needs are. Worldwide in cities building construction has irreversibly closed up on road space. Each city has it's own pattern. Most European cities were built long before cars, roads were just there, along calf path patterns. In fact compactness of cities was necessary as it favoured walking and animal drawn transport. In the new lands there is a mixture of spaciousness and compactness of building. Old city centers are compact. In the walking days they grew upwards, tower blocks and skyscrapers were built so activities could stay close together. There is a matter of prestige attached to high buildings, so they continue to be in fashion, even after walking had been replaced by self driving, and after sprawling outlying commercial centers had been created. That became one cause of congestion, because of the number of cars the high rise centers were attracting. To cater for themselves the high rise buildings were given multi deck parking areas, but they choked the same narrow streets down below. 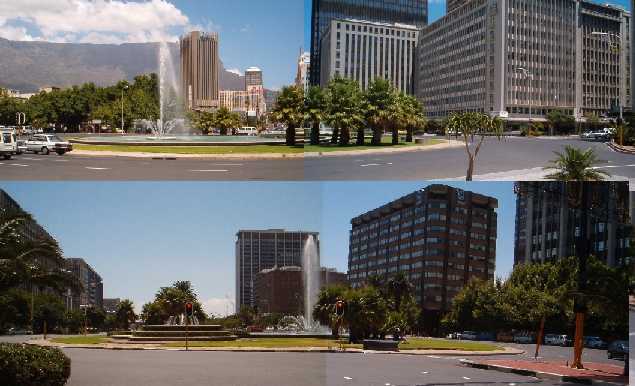 Downtown Cape Town is an example, where a high rise business center draws thousands of cars from outlying areas jamming the major N1 and N2 routes each morning, to queue and bustle through crowded streets into their cubicles, then repeat the process, at the traditional 4.30pm go home time, to jam the freeways again, in reverse. Outlying areas after the 40's and 50's were generally more spacious, and became more self drive related and featured adequate space for roads in many cases, although that was probably more by accident than design, because the forward vision of planners did not stretch to the today situation (see Villiers Road below). These new areas had more promise for congestion to be controlled, but even there road space and traffic flow has often been compromised, not been seen as needing to grow with building and population density, and through roads not being adequately provided (Lorraine). The freeway story is central to the matter of vehicle population growth, described here as the Four Acts of Freeways, as a Shakespeare or Churchill might have described them. Each act lasts 25 years and starts in 1950. Act One In the post World War 2 era there was a spread of limited access freeways which went hand in hand with the growth in car production. The prewar German Auto-bahns were of the first, and had a large influence on the American Interstate System, the founding of which is credited to Allied Commander, General later President Eisenhower who realised their value as they fed the victory armies in Europe. Their first intended purpose in the USA was to allow for an army to be moved over the vast continent if ever it became necessary, not a ridiculous concept in the late 40's early 50's, but the peace time value of freeways soon became clear and with wartime memories slipping into the past, the US became a nation on wheels, with other countries soon to follow. Mankind had found a new level of mobility, could exercise a new level of freedom, and as one important man in the car industry said "we are so successful because we deal in a basic human want, the freedom of movement". But then came Act Two. In the last quarter of the 20th century freeways, and other roads and streets, were receiving more and more traffic from growth in all aspects of increasingly affluent societies. Getting around was no longer so fast. 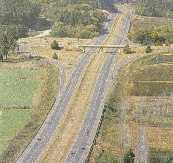 Gradually freeways became snailways, and their for-ever image aquired a worrying question mark. Act Four lies in the future, it is full of mysteries and uncertainties, it is the domain of science fiction, bubble cars floating in space on magnetic fields, propulsion by yet to be discovered inter atomic effects, and the like, who knows what will unfold, we hope something like what microchips were to wires and cables will happen to nuts bolts and spanners. Meanwhile, until that happens, we have to practice old fashoined discipline to maximise the returns from what we have and minimise the wastage where ever we can. The developer is king and commands a lot of influence. In our capatilistic society, private capital built the cities, under local government regulation off course, but the entrepreneurial spirit of the developer must get first credit for innovation, sensational designs and urban growth. With this track record a saintly image can be implied and used in advertising that says things like "plot and plan for only ----", and "another development by ----". But by the developer's position his first allegiance is to the investor which is often himself. At the interface between developer and local government there has been frequent controversy and power play, mostly on environmental and heritage issues, but seldom if ever over road capacity. Road space and road capacity, from established patterns and actions, must generally be seen as enough, by both developers, who dont really care, and authorities, who should care, and more building takes place around existing roads. We dont hear much about traffic environmental assessments and traffic volume forecasts, while building goes on and slow strangulation on the roads continues. At the same time we must be punch drunk on global warming and waning energy resources if we dont see the impact of the congestion we are creating on these two matters by burning unnecessary fuel. Here is an example of proposed new housing that will that will reach right up to the edge of already overcrowded M7 Circular Drive, where developer Wonderwonings is offering 131 new stands on a vacant piece of Fairview. Fence to fence M7 is only 19 meters wide in this area, hopelessly in adequate for a four lane minimum width arterial, that should be allowed for along here. 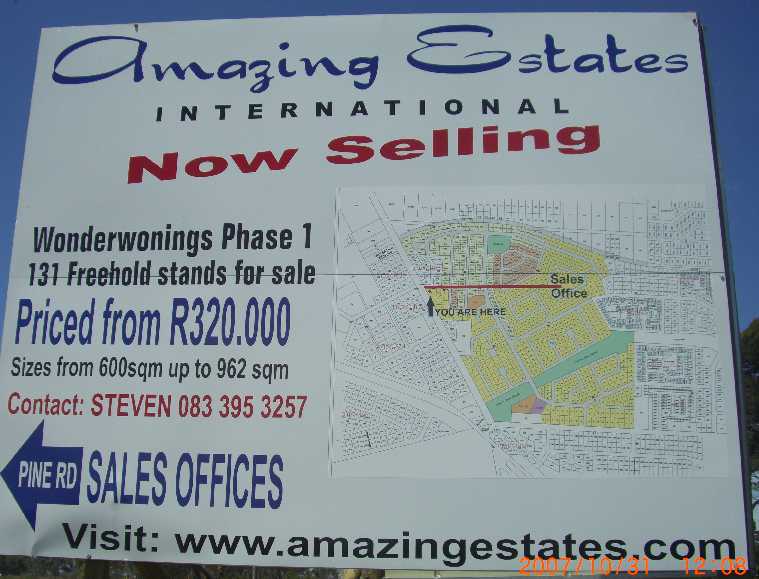 Take note that Fairview was never a densely settled area, not before nor after apartheids resettlement. It is likely that this very large area, bigger than Newton Park, that has been sitting there vacant with an uncertain future for decades, will be built up to the brim within the next decade. It is not hard to imagine the greater congestion this will produce, but what plan for the future is in place. One of the relevant elements in this is a tradition for business premises to face the road. It dates back to the "corner cafe", and "window shopping", before big shopping centers were created. Business owners still believe their premisises need to be seen by passing traffic, so buildings tend to crowd the road, which conflicts with the free flow status arterial routes should have. Demonstrated development patterns on roads that should have free flow for through traffic and limited access, regularly conflict with this principle. 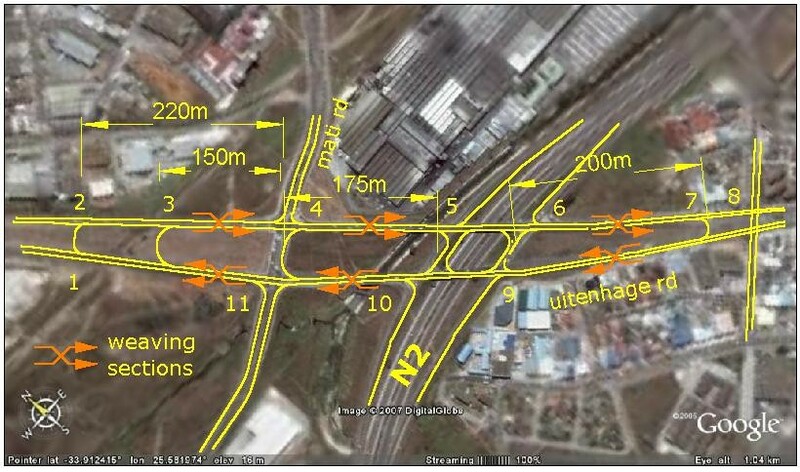 Buffelsfontein M9 and William Moffat M12 are examples where development continues to erode their arterial status. Fig Tree Center was built on a bit of open space that could have been better used to provide a free flowing interchange for the two major arterials M12 and M7 that cross there. There was no need to make Fig Tree Center a corner cafe in case people could not find it, it could just as well have been built on open ground somewhere nearby like around the Elliot center. People would still have found it, and what's more, they would have been thankful for more parking space, because Fig Tree also violates a parking to roof space ratio, by big feet having been shoe horned into a small area. A portion of M7 road reserve was violated to make more parking space available for Fig Tree, which is still not really adequate. Ever tried parking at Fig Tree without power steering? Regarding the new Martime Motors location, again a corner cafe not to be missed by passing traffic. Why, there was never a danger of anyone in the market for a new Merc not knowing where to go to make the deal. And people daily waiting it out at the slow red lights dont want to sit there looking at another car dealer. 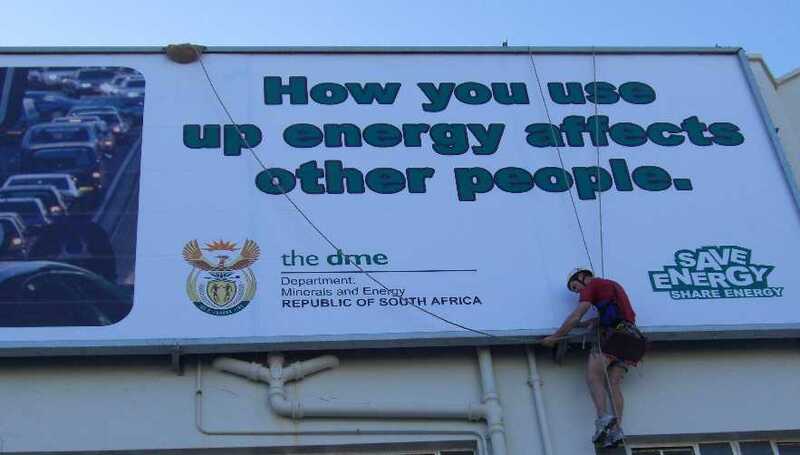 Maritime could certainly have been placed elsewhere without hurting their business potential. 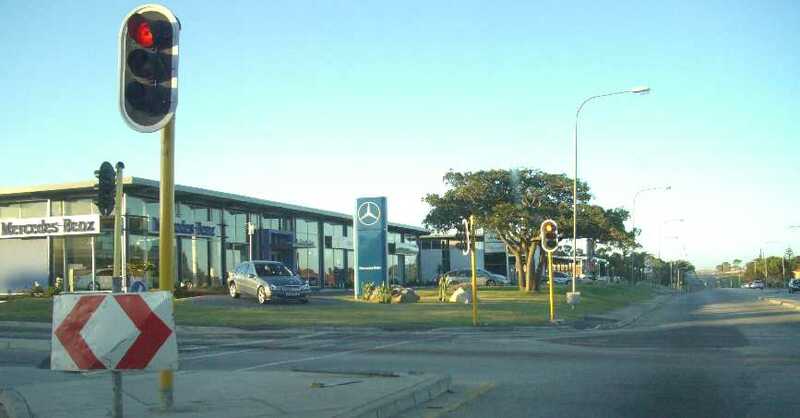 Their "positionally advantageous location impact" is however not quite as severe on the disinterested ubunthu, as Fig Tree opposite, because they do not have the same amount of in-out traffic as does supermarkets and restaurants. Only thing is they have locked the boundaries of an important arterial route. But the Cherry on the Cake of Congestion is really the last corner cafe at this intersection, the New Lifestyle Center, exacerbating all that has been said in the foregoing, and we lost all those beautiful trees as well as an implied continuation route line from Villiers Road through to Moffat (M12), same as Church Road dead ends into Walmer Park. The bit of road widening and extra traffic lights being installed is a knee jerk reaction to this new building center and the additional traffic it will draw. It is interesting to note that the property perimeter is exactly within the old reserve lines maked up on the satelite photo at the top of this page, celebrating the calf path concept into perpetuity. A question mark hangs over local government, are they going to recognise and reverse this trend. We still have time, while there is open space, but better hurry before it is too late. This subject is a problem in all cities country wide and world wide. On the opposite hand, in an example of negative planning, road reserves were violated around a flyover bridge on William Moffat Expressway by planners and administrators who probably thought it would never be needed. The sad part is that we got the flyover for nothing, and it is desperatelty needed today, but it has now been so locked in by other building construction that it will not be easy to commission. 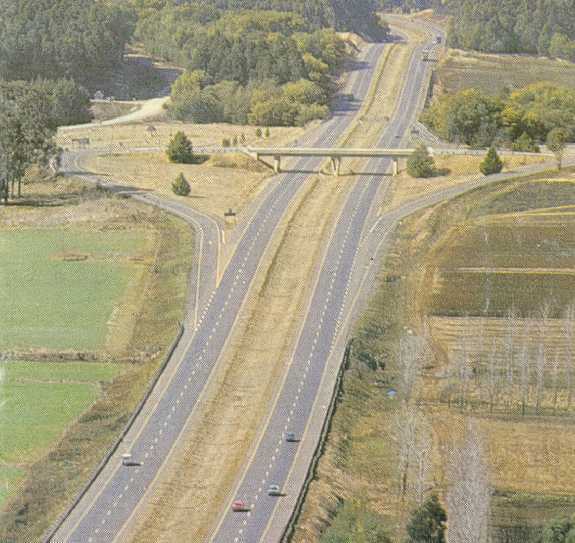 As a bit of history, this flyover was to have formed part of a freeway through the Baakens Valley planned during the 1970's. 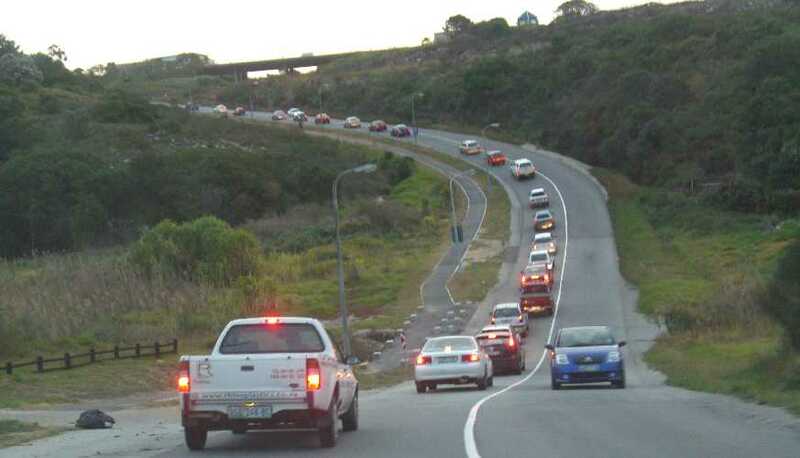 After long and hard battles over environmental concerns, the freeway proposal was ultimately not implemented, but while its approval was still under consideration, the Moffat extension to Cape Road was approved. The flyover was then built in case the freeway was also later approved. Notice in the RH photo how a long traffic stream builds up ahead of slow moving right turn signals (out of sight) while the portal of the said flyover becons in the distance. 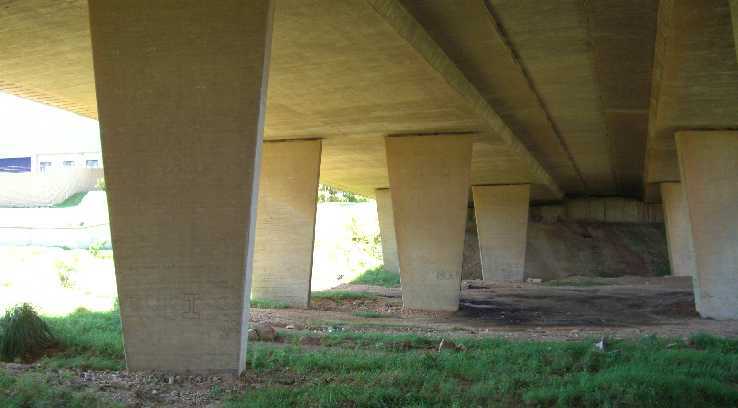 When the Moffat Park development took place, the existence of this flyover was disregarded, sadly because those in charge then did not follow the golden rule of open endedness in planning, or the impact of the development on future traffic just was not part of the equation. It will be shown that this flyover if commissioned can provide considerable relief towards congestion in that area. 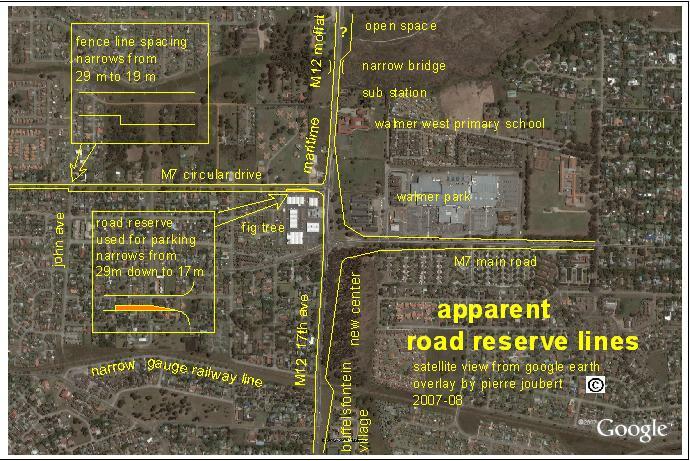 It is not implied that the Baakens Valley Freeway concept needs to be resuccitated for the flyover to be of benefit. Without the rest of the freeway as was originally intended the flyover can reduce the local crowding in this busy junction of roads. Car dealer Williams Hunt fought for permission to build their new premisis in this position, because of the high visibility they expected to receive through being located on a main thoroughfare. However this position should have been reserved for road use along the original intent when the flyover was built. This building sits right on top of a once intended flyover cloverleaf. In this satelite photo downloaded from Google Earth buildings on the positions of future cloverleafs can be seen.